As people get older, changes in metabolism can make it challenging to maintain the correct body temperature. Fortunately, there are many things that can be done to ward off the chill whether your senior loved one is at home or enjoying a day out in the community. 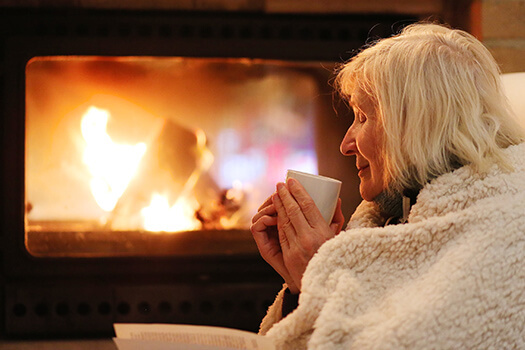 Use these tips to help your loved one stay warm throughout the winter months. Your loved one’s home heating system is the first defense against the cold. Make sure the system is working properly by arranging for a seasonal inspection before the cold weather comes, then check it periodically to make sure it continues to function during the times when it is needed the most. Hiring a professional caregiver is another way to ensure your senior loved one stays warm and receives help with everyday tasks during the winter season. Oshkosh home care experts are available to provide high-quality care to seniors on an as-needed basis. From assistance with mobility and exercise to providing transportation to the doctor’s office and social events, there are a variety of ways professional caregivers can help your aging loved one continue to live independently. Seniors must make it a priority to stay active even when the cold weather limits their time outside of the house. Regular physical activity can get your loved one’s heart rate up, and the blood pumping through the body can help him or her stay warm. Try to plan outdoor walks during the day when it is warmer, and remember that even moving indoors throughout the day can help your loved one stay warm. Seniors who need help exercising and managing other daily activities can benefit from professional in-home care. If your senior loved one needs hourly or live-in care, Oshkosh Home Care Assistance can help. Our caregivers can assist with exercise and mobility, prepare nutritious meals, provide timely medication reminders, and help with a wide array of other important daily tasks. A senior’s body can experience rapid changes in temperature, and encouraging your loved one to dress in layers can modify his or her body temperature as needed. For instance, your loved one could wear a short sleeve shirt underneath a warmer sweater or cardigan, and a coat can be added if he or she ventures outside. If your loved one has difficulty getting dressed, make the process easier by providing dressing aids such as button hooks so he or she can stay independent. During the summer, your loved one may have enjoyed frozen treats and smoothies. Now, switch it up by offering warm drinks such as hot cocoa and decaffeinated tea. You can even turn this into a social activity by setting your loved one up with a tea party with his or her favorite caregiver and friends. A home heating system is more efficient if cold air is not seeping into the house. Spend some time checking around each window and door to feel for cold air. If you feel a draft, seal the area with caulking or weather-stripping. This is especially important in rooms where your loved one spends the most time since a cold draft could quickly give him or her a chill. During winter weather warnings, you must take extra precautions to ensure your loved one is never stuck in the cold. If a visit is not possible, call your loved one each day or arrange for a caregiver to check in on him or her. Make sure to have an emergency plan in place in case your loved one’s utilities or heating system go out. For instance, you can provide transportation to a community center or family member’s house where he or she can continue to stay warm until the crisis is over. The winter season makes seniors susceptible to several health concerns that can make it difficult for them to manage everyday activities. If your aging loved one needs occasional help with bathing, grooming, cooking, or other basic household tasks, or if you need time to attend to important personal matters, reach out to Home Care Assistance, a leading provider of live-in and respite care. Oshkosh seniors can maintain their independence while living at home with the help of our reliable respite caregivers. To hire an in-home care expert for your aging loved one, call one of our friendly Care Managers at (920) 710-2273 today. How Can Older Adults Stay Safe During Summer?